Forsyth and Gwinnett counties are made richer by our Chinese, Korean, and Vietnamese American communities. 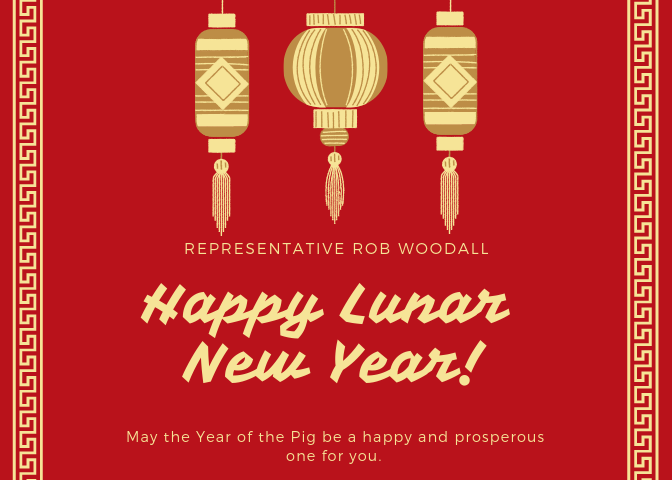 On behalf of the Seventh District, I would like to wish you and your loved ones, happiness, prosperity, and good health in the new year. It’s always a great event when the President comes to address Congress and the American people. The political stalemate that has long plagued Washington needs to come to an end. It’s a time that everyone needs to come to the negotiating table, because I know if we work together, Congress and the President can solve so many of our nation’s problems, we can build new relationships, and we can deliver results for our constituents. On Tuesday, the President laid out his vision. It is now incumbent upon Congress to enact that agenda that works for all Americans. We need to sit down and work together and find that common ground, and I invite my colleagues on both sides of the aisle to come to the table. Click on the image below to watch my full statement. The day after the President addressed our nation, MSNBC invited me to offer my insights and analysis. 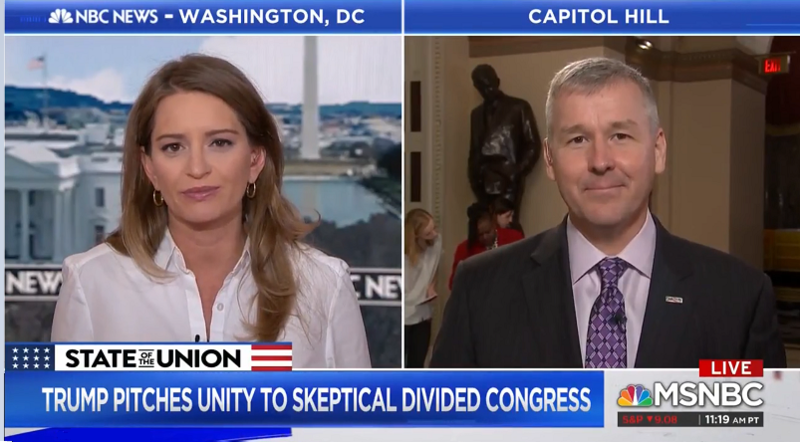 In our interview, I described the unifying message of President Trump’s speech and how Congress can capitalize on the State of the Union’s positive reception. Click on the picture below to watch. One of the highlights of my time in Congress has been serving on the Transportation and Infrastructure Committee. In 2015, we gathered bipartisan consensus and enacted a five-year bill called the FAST Act, which has since directed billions of dollars to Georgia’s infrastructure needs, helping to attract new jobs and begin construction on critical projects designed to cut traffic within the metro Atlanta area. That bill expires in 2020, and we on the committee are now tasked with building on the success of the FAST Act. In 2016, then-candidate Donald Trump promised a major infrastructure bill, and over the next 18 months, I am committed to helping him fulfill that promise. We kicked off that process last week when we convened in the Capitol to hear from a wide variety of stakeholders and local officials and solicit their ideas. Among our challenges will be modernizing our funding mechanism, removing unnecessary bureaucratic obstacles that slow progress and raise costs, and ensuring our nationwide, intermodal transportation system better serves the American people who rely on it. I look forward to the difficult work ahead in finding consensus with a Democratic House, Republican Senate, and President Trump. I have no doubt it can be done, and I am also certain a final product will be made better by your input. As always, I encourage you to contact me and share your ideas on how we can make our infrastructure the envy of the world. Last week, the House Budget Committee met for a hearing regarding the potential effects of adhering to statutory budget caps on discretionary spending for Fiscal Year 2020. As you may recall, the most recent Bipartisan Budget Agreement raised defense discretionary spending to repair our military, which had been chronically underfunded, and as a result, increased our nondefense discretionary spending for Fiscal Year 2018 and Fiscal Year 2019 above those spending caps. However, for FY20, the budget caps are set to reactivate, cutting total discretionary spending about ten percent. Rather than discuss the need to prioritize national security and address our ever-growing national debt, the majority members of the committee began laying the ground work for their next budget resolution which will allow discretionary spending to balloon out of control. 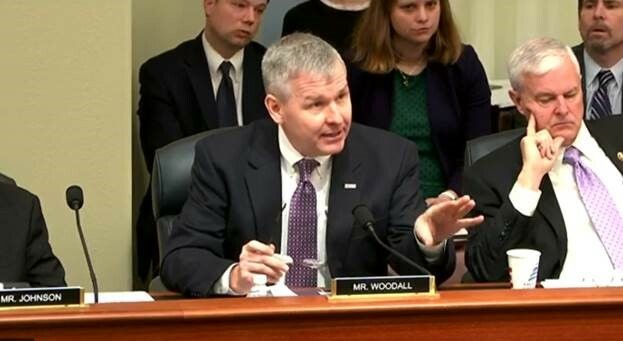 I had a chance to question the witnesses regarding how we could best prioritize our spending for health care and education initiatives, which we all agree are vital for the American people. Click the picture below to watch the exchange. I had the pleasure of joining my colleagues last week in supporting an overwhelmingly bipartisan bill that ensures our nation’s heroes have access to child care when they must travel to certain Department of Veterans Affairs (VA) facilities for scheduled health care services – H.R. 840, “The Veterans' Access to Child Care Act.” While some veterans across the country may have already experienced the benefits of the VA assisting in securing child care, as this benefit was rolled out back in 2010 as part of a pilot program, the unfortunate reality is that too many of our heroes across the nation, in certain instances, must still decide whether to forego or reschedule critical health care appointments because they cannot secure appropriate child care. That said, while the pilot program was set to expire back in 2017, lawmakers in the 115th Congress moved to extend the program through 2020 as they recognized how valuable the benefit is to our veterans who need to make appropriate child care arrangements so that they can make their appointments. In fact, lawmakers in Congress recognize just how beneficial the pilot program is as the House has voted not just once, but twice, over the last 2 years to expand and make permanent the authority of the VA Child Care program nationwide. I wholeheartedly believe that this legislation is a wonderful example of how lawmakers can work together across party lines to deliver common-sense solutions that improve access to care for those among us who have sacrificed everything. As such, it is my hope that you’ll join me in urging Senators Isakson (R-GA) and Perdue (R-GA) to take up this important bill so that we can continue working to improve care for our nation’s heroes. 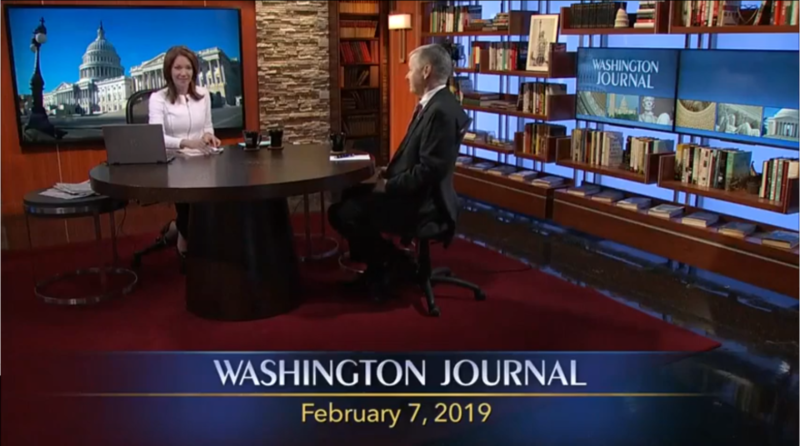 On Thursday, I joined C-SPAN's Washington Journal, to discuss different transportation and infrastructure proposals from Democrats and Republicans. In addition, we discussed Congress’ post-State of the Union agenda and my bipartisan education legislation. Click on the image below to watch our entire interview. Please support H.R. 582 and S. 150, the Raise the Wage Act (the “Act”). In real terms, the $7.25 hourly federal minimum wage is 25% less than it was fifty years ago. The Act would increase the federal minimum wage to $8.55 this year and then incrementally to $15.00 by 2024. After that, it would adjust to keep pace with inflation. Estimates are that the Act will affect 29.2% of the wage-earning workforce, or over 40,000,000 Americans. It ensures that tipped workers and others are paid at least the federal minimum wage, and could improve economic security across all demographic groups. Please support H.R. 582 and S. 150. Give 40 million Americans a much-needed raise. As your constituent and a FreedomWorks activist, I'm urging you to oppose the Raise the Wage Act of 2019. Such legislation will do more harm than good, and it will hurt the exact groups of people that some in Congress say that it will help. This bill will destroy working class jobs, cause prices of everyday goods and services to skyrocket, and chase American jobs overseas. And we have the results to prove it! Practically every city and state that raised their minimum wage has lost jobs, increased prices, and middle and working-class families have suffered. 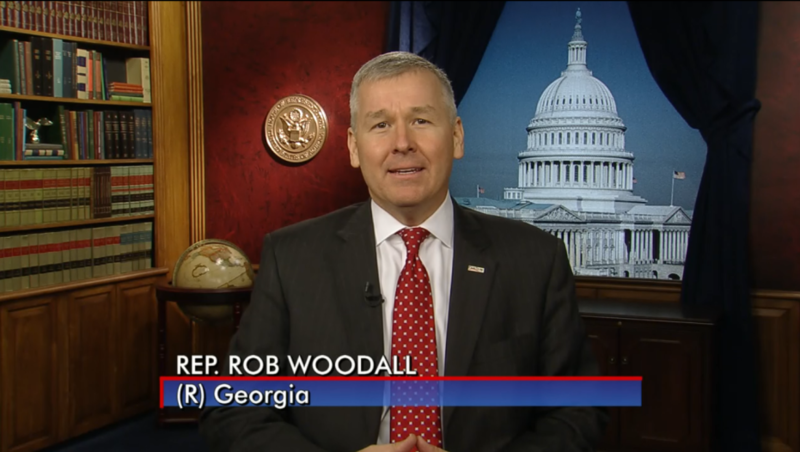 Representative Woodall, please protect America's workers and their families by opposing the Raise the Wage Act of 2019. We need to follow Amazon’s historic lead and raise the minimum wage for all US workers. Currently, there are millions of working Americans in poverty because they are being given an abysmal $7.25 an hour -- that’s only $15,080 a year for a full-time worker. Paying low wages is a choice for employers -- and smart companies can, and should, make a better one. That’s why I support Amazon’s move to pay their workers a livable wage and join their fight to finally raise the federal minimum wage. We can all agree on the importance of good, high-paying jobs. And the good news is that there are more jobs available now than at nearly any point in the past 50 years. Unemployment is low, job openings are high, and none of that is due to government-controlled wages. The federal minimum wage is a floor and not a ceiling, which means states and local governments are free to establish minimum wage rates that exceed the $7.25 per our federal rate—and many have. The fact is that the purchasing power of a dollar is vastly different for someone living in Manhattan than someone living in rural Georgia, and 29 states, several cities, and the District of Columbia have adopted minimum wages that exceed the federal rate to levels they consider more appropriate to their needs. What’s more, the minimum wage is not intended to be a living wage, but rather a starting point for those just starting their first job—about half of minimum wage workers are between the ages of 16 and 24 years old—or those looking for work after they’ve retired. Mandating businesses to pay a higher wage, regardless of experience level or productivity, will force businesses to cut hours and higher fewer employees, with estimates saying as many as seven million jobs would be eliminated if the federal minimum wage were raised to $15 per hour. We have seen a glimpse of potential repercussions in Seattle, which recently raised its minimum wage rate and which saw the overall number of hours worked in low-wage jobs and earnings in those jobs drop. Also, it is important to note that even in the absence of legislation, businesses, like Ruben mentioned, are moving beyond the federal minimum wage and creating their own company minimum wages. Amazon, Target, and Walmart are three big examples, but locally, look at the sign in the window at local businesses throughout our community. Part-time cashiers aren’t being hired at the minimum wage; they are being hired at a wage much higher, especially in today’s tight labor market. The marketplace really can work if we commit ourselves to keeping it fair and transparent. When it comes to excellence in education, our schools in Gwinnett and Forsyth counties are second to none. Without a doubt, their success could not be possible without the tireless efforts of the parents, teachers, and administrators back home who have encouraged our youngest generations to reach their fullest potential, and I’m proud to recognize the efforts of one such school in the Seventh District – the Gwinnett School of Mathematics, Science, and Technology (GSMST). GSMST was recently ranked #13 on Niche’s list of 2019 Best Public High Schools, and was selected as the #1 public high school in the state. What’s more, nearly half of the schools recognized as Georgia’s top public high schools hail from the Seventh District, with Lambert, South Forsyth, and North Gwinnett joining the ranks of GSMST in this distinction. Congratulations to the students and educators at GSMST and all our Georgia schools whose hard work led to this great honor! With so much of the nation focused in the past few weeks on domestic policy challenges and the State of the Union Address, it’s easy to forget that there are critical issues happening across the world. This week, the House will consider H.J.Res. 37, which directs U.S. armed forces assisting the Saudi-led mission in Yemen to cease such action no later than 30 days after the bill becomes law unless a formal declaration of war or other resolution authorizing the use of military force in Yemen is passed by Congress. Clearly, no American wants to put our brave men and women in uniform in harm’s way for no reason. And clearly, no American wants to jeopardize our nation’s important relationships with our allies in the Middle East. That’s why it’s also clear that this is going to be a very interesting and important discussion about our future with Yemen.